Waist length pieptar sheepskin jackets, decorated with black embroidery and edged with black leather, and black velvet collar. 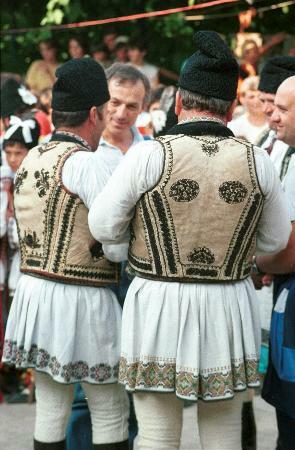 Hip length cămasă dreaptã with gussets, decorated with row of embroidery on hem. Black căciulă (sheepskin shepherds hat). Photo taken in Budacu de Sus, Bistrița-Năsăud, in July 1991.